You don't have to wait for a special occasion to spice things up. A new hairdo can do wonders for your mood. This doesn't mean you have to dye your hair a different color or cut it. There are lots of things you can do with a few tools. Steam Curlers: I use Caruso steam curlers to create soft curls. I've had the set that I use for over 15 years. It's the first type that came out and requires salt in the water to make it work. They have become more user friendly over the years and don't require the salt anymore. TopStyler Ceramic Shells: My husband bought me the TopStyler ceramic shells for Christmas and they are really cool. They create a nice wave in your hair. It's basically like creating a pin curl. You create the curl with your finger and then put the clam shell over it. Curling Iron: It's good to have at least two sizes, a 1 1/2" and a small barrel (1/2"). The 1 1/2" barrel creates volume and body and the 1/2" creates tight curls. 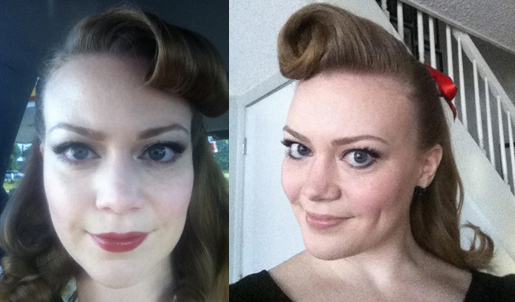 Many times I will use the large barrel and pin each curl to my head after I make them. I will then do my makeup and let them out after about 10 min. This allows them to cool and set and creates more volume. Styling Products: Lately, I've been using Bumble and Bumble products on my hair. If I want to create volume and make my style last longer I will layer on Tonic Lotion, Styling Lotion, and Thickening Spray. Any you can't forget the hairspray. I'm not going to recommend one because it changes every time I go to the store. 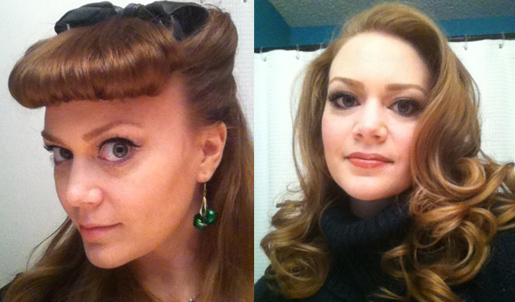 Other accessories that I use are lots and lots of bobby pins, flowers, bows, and scarfs. Youtube Channels: Lillithedarkmoon specializes in unique hair styles, Lisa Freemont Street, Pinup Doll Ashley Marie, and The Cherry Doll Face. 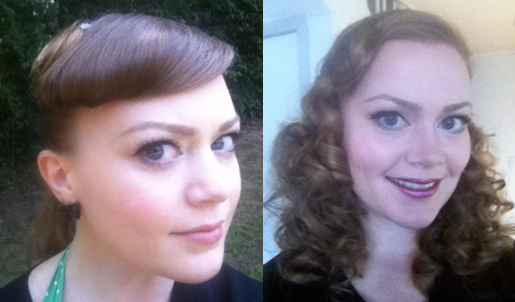 If you visit these sites you will recognize some of my hairstyles below.